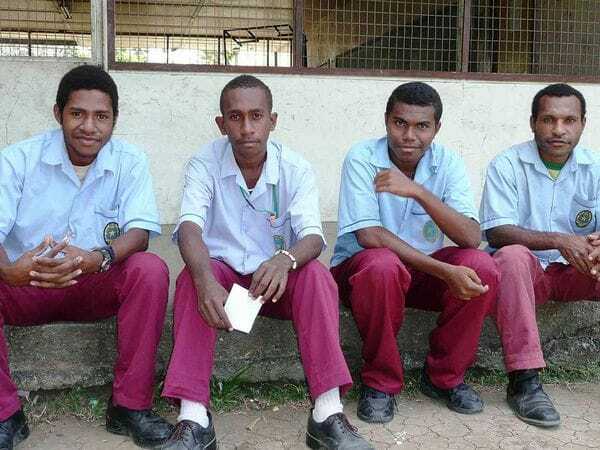 The Lasallian Mission Council would like to express its deep appreciation for the hard work of Lasallian Youth Ministers across Sydney after coordinating a highly effective Stationery Drive to help fellow Lasallian schools in Papua New Guinea. The school-based campaign was organised by the Youth Ministers during Term 3 and the Provincial Office has been overwhelmed by the positive response with large donations of new and packaged school supplies to be sent to PNG early next year. A team of Young Lasallians, including the Lasallian Youth Minister at De la Salle College Caringbah, Jake Wedesweiler packed a utility truck full of stationery donations last month to be stored at De La Salle College Revesby, ready to be packed into a shipping container bound for PNG. We are most grateful to De La Salle College Revesby Principal, Mr Tim Logue for setting aside storage space at his school and to All Saints Liverpool and De La Salle College Caringbah for donating classrooms-worth of furniture as part of the resources campaign. This follows a highly successful campaign last year in which 11 Sydney schools made generous donations which have since been distributed to those in greatest need in Papua New Guinea. This year, we are also grateful to Killara High School, Kuringgai Creative Arts High School, Our Lady of Mercy College Burraneer, Casimir College and Oakhill College for donating secondary textbooks and other teaching resources. St Michael's College in Adelaide has also kindly sent donations of uniforms to assist schools in PNG. Primary schools across Sydney have also responded generously to the campaign this year with large donations received so far from Villa Maria Catholic Primary School in Hunters Hill, St Therese's in Denistone, St Mary's Star of the Sea in Hurstville, St Martha's in Strathfield, St Michael's in Daceyville, St John Vianney's in Greenacre, St Mark's in Drummoyne, St Francis Xavier's in Ashbury, Blessed Sacrament Primary in Clifton Gardens, St Brigid's Primary in Marrickville and Marion Catholic Primary School in Horsley Park. Sydney-based schools who would like to contribute to the campaign can contact the Lasallian Mission Council's Operations Manager Julie Alibrandi or Communications Officer Michael Kenny.